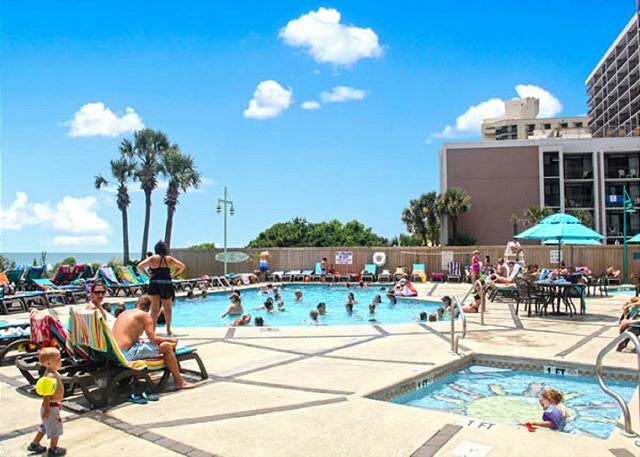 The resort is located in the beautiful section of the beach known as the 'Golden Mile' in the north part of Myrtle Beach. 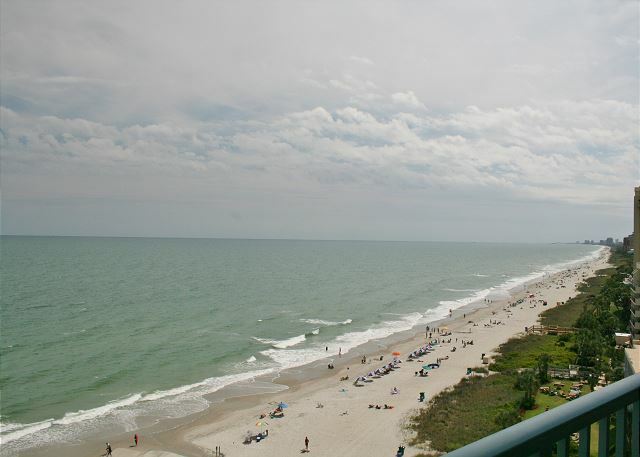 Condo 1033 is located direct oceanfront on the 10th floor with amazing views of the beach and ocean. 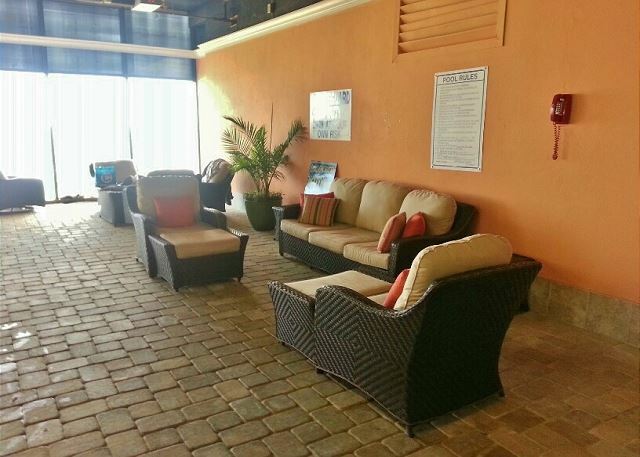 Just open the sliding glass doors, sit on the balcony and relax to the comforting sounds of the beautiful sea. It will sleep 4 people with 2 new and very comfortable queen size beds. 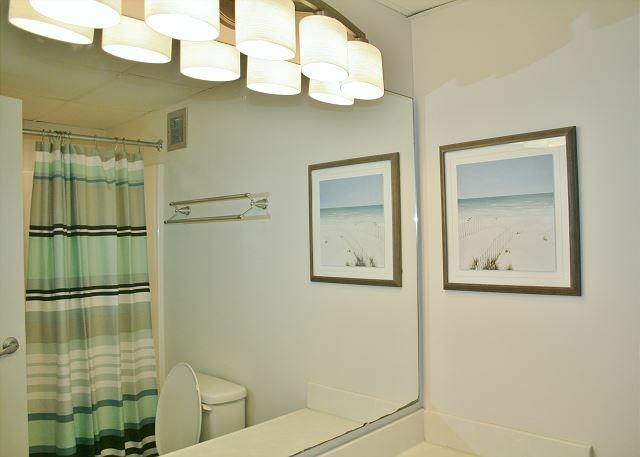 The condo has been completely remodeled with beautiful wood-look ceramic tile throughout. 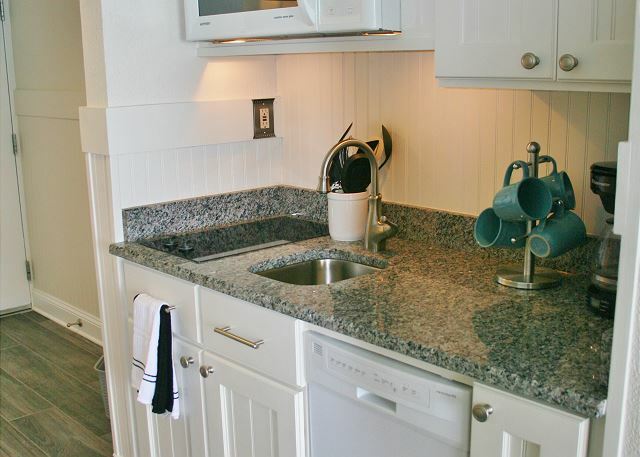 There is a full kitchen that has been completely remodeled with new cabinets and countertops. 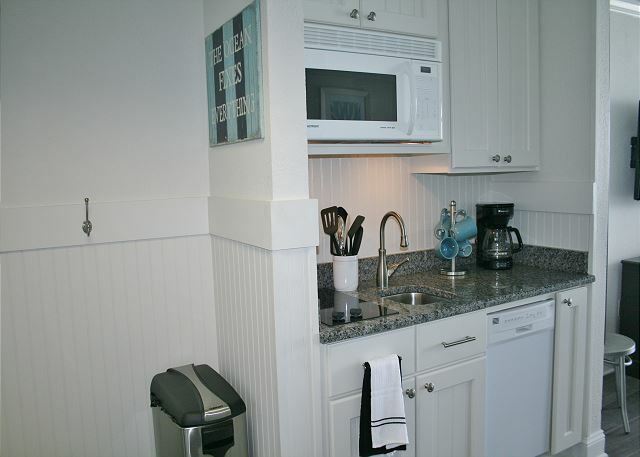 It includes a 2 burner ceramic cooktop, full size refrigerator, dishwasher, microwave, coffee pot, and any pots, pans and dinnerware you will need. 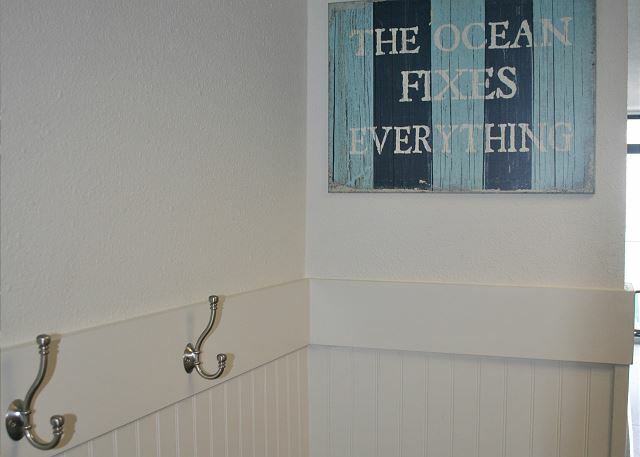 The decor theme of ocean colors is sure to create the mood for a relaxing beach vacation. 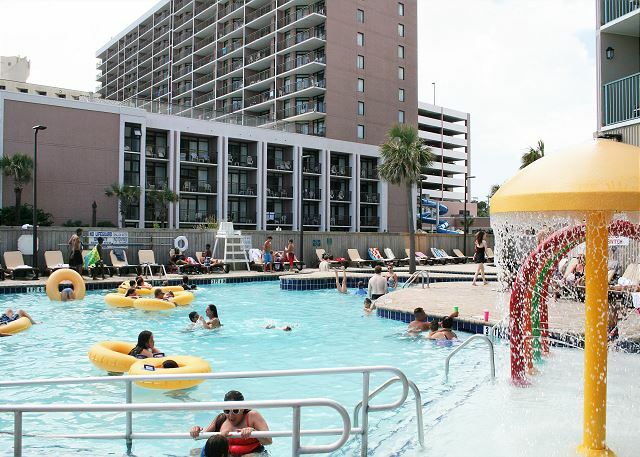 Onsite waterpark is privately owned and we do not have access. My wife and I thoroughly enjoyed our stay at this condo. Several of the reviews we read before coming left us wondering about cleanliness and broken balcony chairs, but we found no problems at all. We will book the room again when we have opportunity. My husband and I took our 3 and 1 year old on a family vacation and made the trip mostly about them..which made the trip worth any issues we had because the kids were happy, safe, and slept in clean room. However, even though the size of the room didn’t phase the kids, it was a bit tiny for family of four. Two beds were provided as described however, the bathroom was a bit small when trying to bathe and ready two boys. 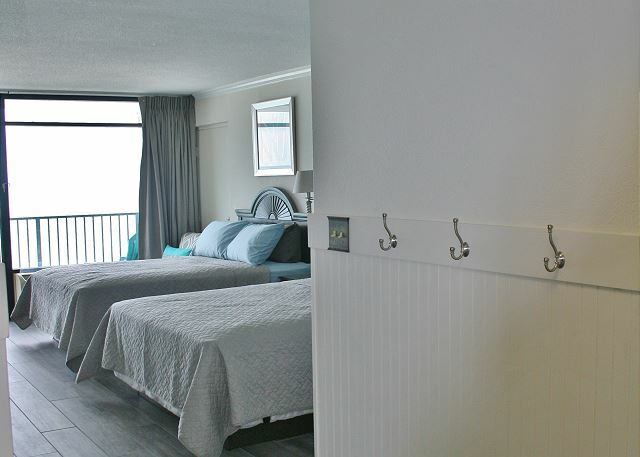 Also, the room could have used couple small throw rugs or a mat by front door and sliding door to catch any extra sand from feet (balcony was sandy, of course). The kitchen was a kitchenette and not a full kitchen. No oven. Took a while for stove to boil any water, and sick was super small. Not much counter space to make a family of four dinner and do dishes. The dishwasher was fabulous though I will say! BUT none of that small stuff mattered because the view was AMAZING and that’s so important on a beach vacation. The location was great. The room was spotless, very clean. PLENTY of linens, blankets, pillows, towels provided. TV was older and not many channels and definitely not a lot in HD but a nice size. Not much space for pack n play but furniture could be moved and all furniture was new and updated! Beach chairs provided. New balcony chairs provided. 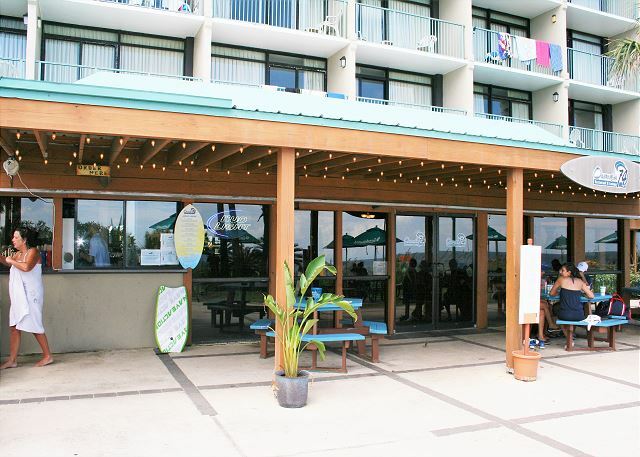 We did not have to speak to the owner or rental staff really at all so no comment there however the actual staff at the resort were not welcoming and off-putting but they are separate from Oceanside. However, it made us feel unwelcomed and “ in the way” when we asked questions so for that we probably wouldn’t stay here again. But we appreciated what we got for the price and the view was worth the small upsets. The room was well maintained and clean. All items were as pictured and enough amenities to accommodate the 4 members of our family (2 adults & 2 children). We have stayed at this resort for the past 2 years and this year was much better because of the updated, modern, and clean room. The only thing that I would have changed was bring my own pillow and place a rug at the entrance to the front door and the sliding glass balcony door to get off access sand so it's not tracked through the room constantly. Also, the Adirondack chairs on the balcony were broken which seemed a common comment from others in the past. Overall, a great stay and would book this room again. The place was very clean. 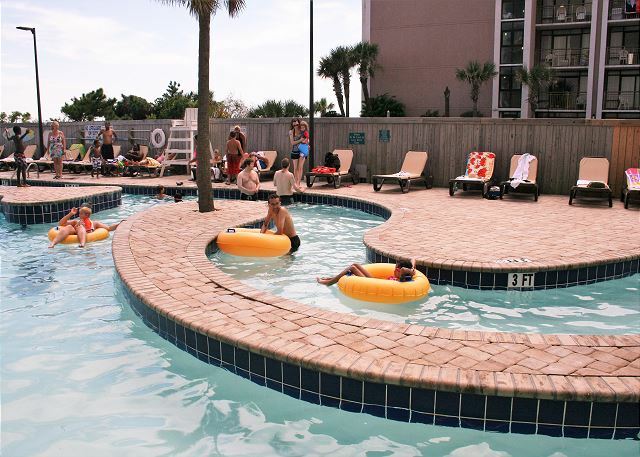 The pool area was great for adults and kids. Beautiful view from our room. Very friendly staff. As far as our room ... it was clean and had all items we needed. Beds were comfy. The outlets would not hold the plugs (for blowdryer etc) And the balcony chairs were broken. Other then that everything was great. Would definitely stay there again. 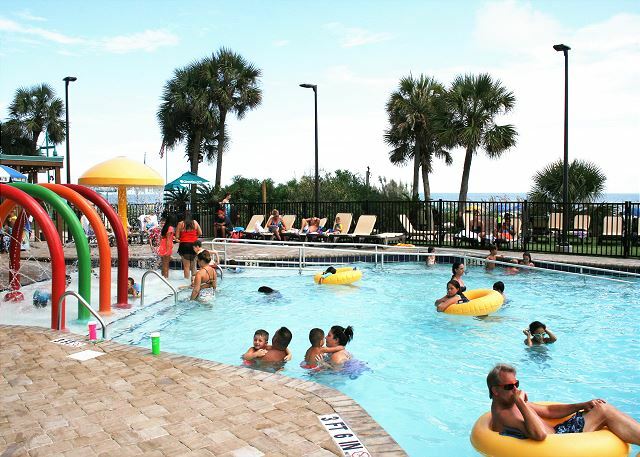 We are so glad that you had a wonderful vacation here at our beautiful beach. 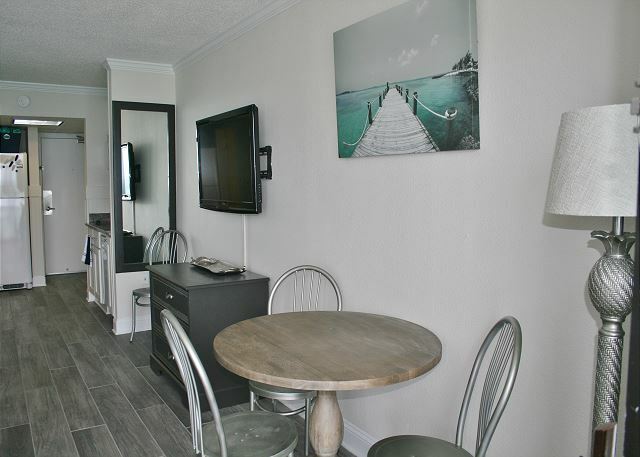 The Condo is perfect for a short get away. However we walked in to only one bed having a bed spread. Thankfully I brought my own. Also the entire resort didn’t have water for an entire day. It was off from around 9am and still off until after 6pm, When contacting the front desk to inquire they was very short, bothered sounding and not at all apologetic. Therefore we had to cancel family pics that was scheduled for that day and missed going out to dinner, which put a damper on our 3 day trip. Newly renovated and updated condo. 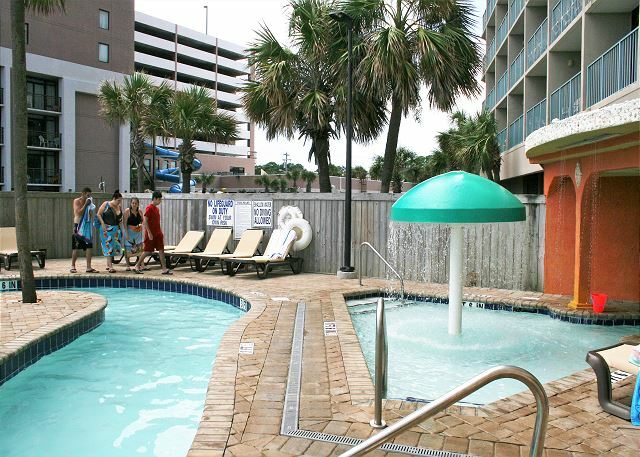 Comfy beds and all amenities you could need. Nice location. Beautiful view of the ocean from the room. 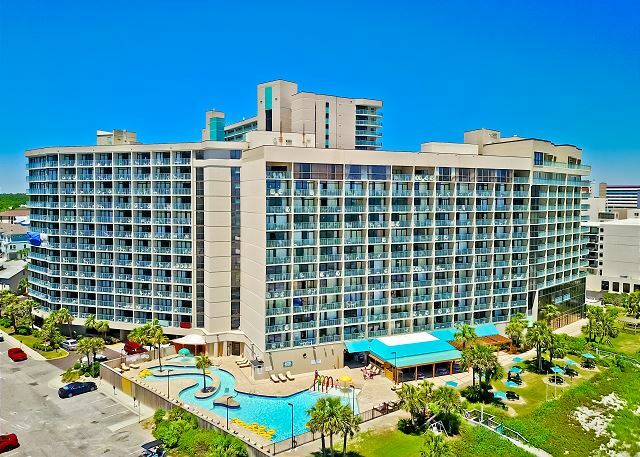 You are on the 10th floor so you are able to fall asleep to the sound of the ocean waves. Would definitely book it again. Absolutely loved this place! Great room, perfect for 2 adults and 2 children. I loved the view and the resort overall. I will be back! Very nice condo. Clean and view from balcony was awesome. Very nice property with incredible view of the ocean! 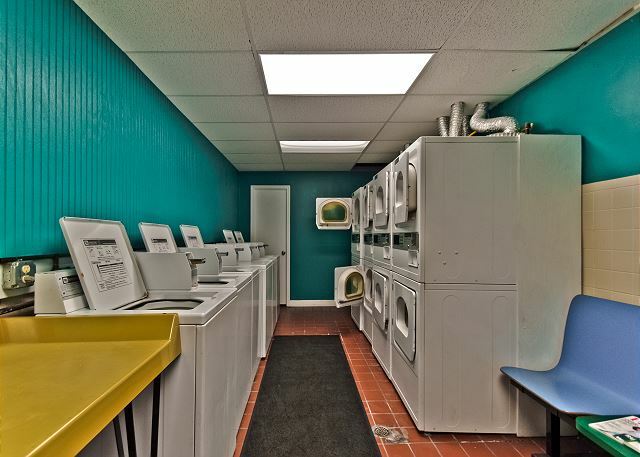 Nicely renovated and very clean! I would absolutely recommend it to anyone. We stayed for 7 nights and it was perfect except for the 2 week-end nights where we had neighbours who "partyed" until 4 AM both nights... I guess that is just bad luck/timing! 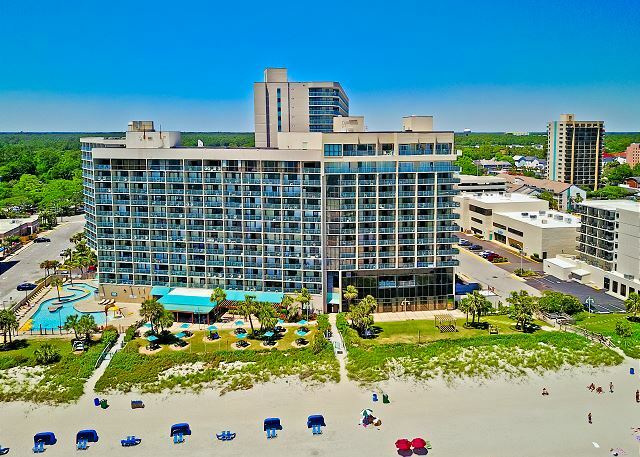 Also, In the property description, it mentions Tennis, but there is no courts available around according to both the "hotel" reception and the Ocean Breeze Beach Vacations lady we exchanged with, so I would remove that to avoid creating un-necessary expectations. Great sunrise and sunset views. Incredible view of ocean. We decided last minute to make a quick trip to the beach, and couldn't have been more pleased with our room find. It was the perfect size for us, a d had everything we needed. 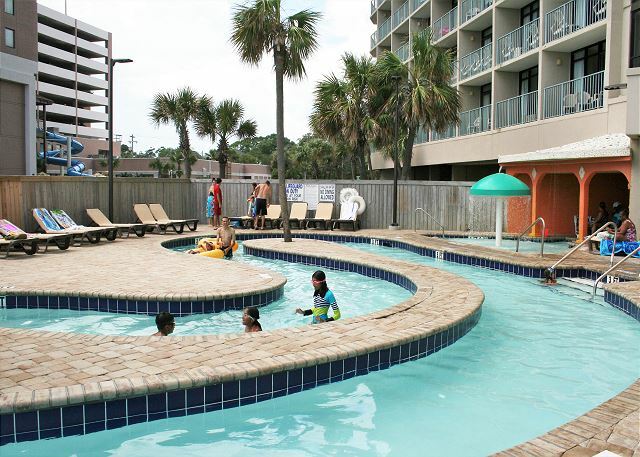 I loved the easy access to the beach and the outdoor pool was nice. I was pleased I the quick response from the renters since it was last minute. 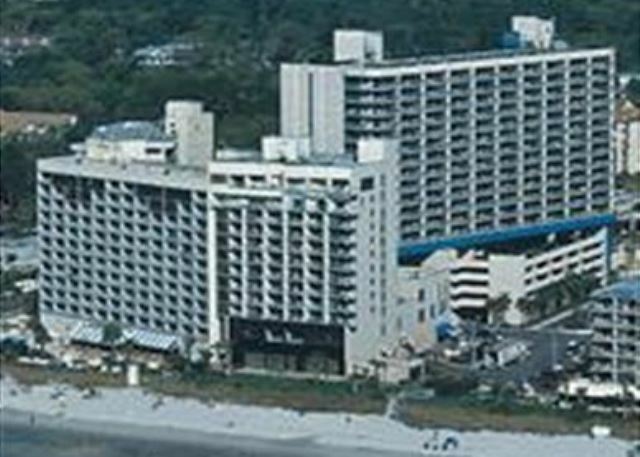 We hadn't been to myrtle beach in over 10 years,however I can get we will be back at this same season again in the future. The weather was great and seeing smiles on my kids faces sealed the deal. View that you can't beat. Our vacation was amazing. There were a couple of issues with the room itself like the curtain rod was coming out of the ceiling and it seemed like the cleaning people needed to pay a little bit more attention to things that are above the floor but overall it was clean. The room was beautifully decorated and very comfortable. The most amazing part was the VIEW it was unbelievable. I had read Past reviews of the resort itself not the room and people were saying that there were lots of bugs and things like that and I will say that we did not see one bug we had no issues at all with bugs. I will say that the building itself is in need of updates but otherwise it was an amazing vacation and I definitely would go back again. We had a great time ! The condo was very nice , had everything we needed . It was nice knowing that if we didn't want to leave the grounds , we didn't have to since there are places to eat, drink and even to shop right there !! The only thing that would have been nice is a couch to sit on while watching tv at night . One hot tub wasn't working and that was kind of an inconvenience but we did get to use the other one night at least . Minor problem when we first arrived the room had not been cleaned. Jumped the gun and emailed the owner. However the cleaning staff arrived shortly after we arrived and explained they were a bit behind. After that the room was cleaned while we did our food shopping. The kitchen was well stocked everything we needed was there. The room was actually ocean front with a great balcony. Parking was a bit tricky but not horrible. Would like to stay here again. This place was cute for 4. I enjoy the room they had everything. But if you drink wine bring your own wine opener. Over it's a nice view, they had bed bugs protection on the bed, lots of towels that will last, and it felt very comfortable. The building its self like the elevator need a new carpet it smells, so it made the whole elevator stinks. 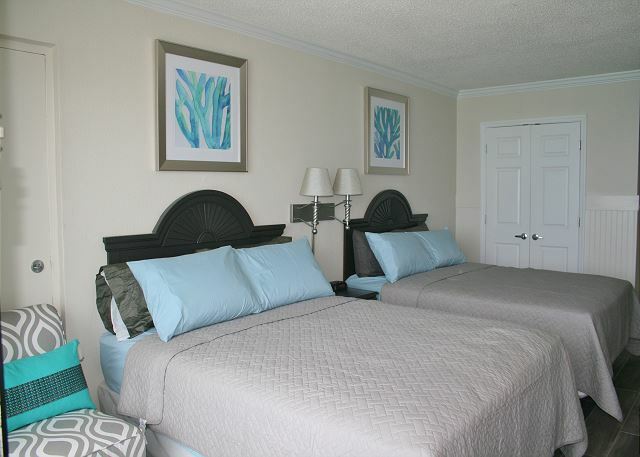 The room was very clean with beachy updated decor and calming colors. 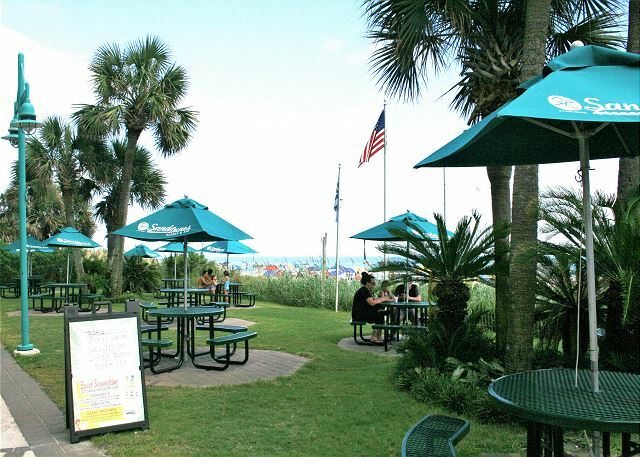 Great place for my sister and I to enjoy a beach vacation. I would definitely stay here again. ..great beach, nice location, beautiful view. The room was equipped with all we needed. 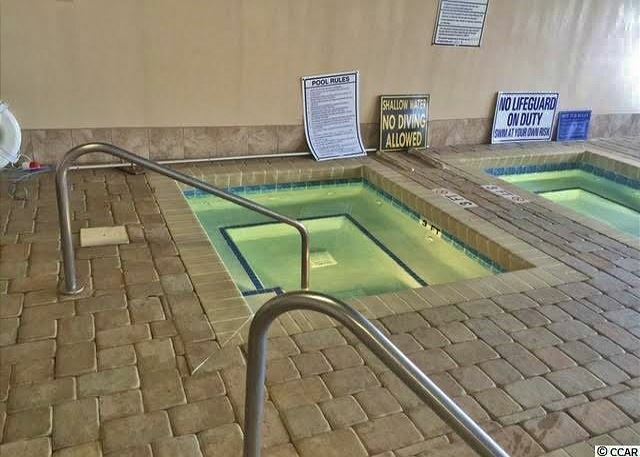 If I stay again, I would call to confirm that pools are open. ..lesson learned for all future vacations. Overall we had a great stay! We stayed 3 nights, the room and the bathroom were very clean. 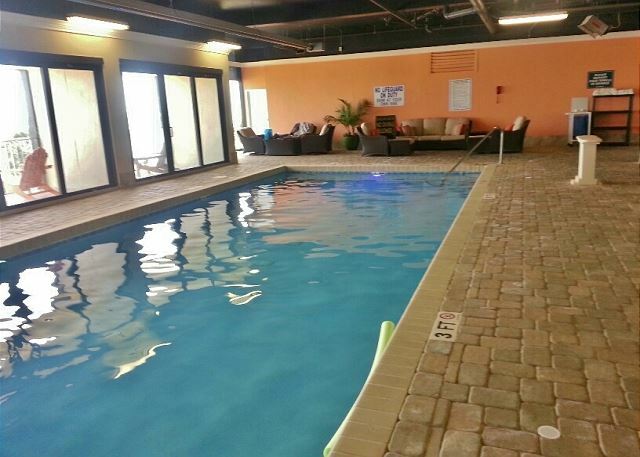 It's at a great location also and not too far from broadway and the strip. 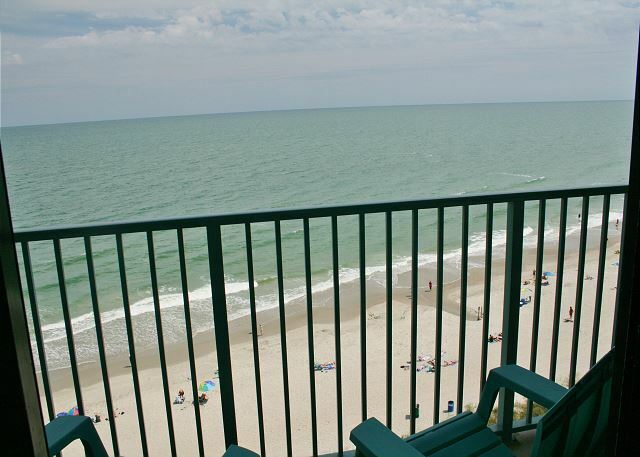 The oceanfront view that the room has is also wonderful! The ONLY problem that we ran into was our information had the wrong pass code on it to get into the room. Luckily the guy that was cleaning was still there when we were trying to get in and heard us at the door and gave us the right code to get in the room. So before you get there I would contact someone to make sure you have got the right code for the lock on the door. My stay was enjoyable. I was blown away by the ocean everytime I entered the room. Room was clean and well decorated. I stayed during Thanksgiving and the room didn't have an oven, only a 2 burner range. I had to purchase a counter top oven to prepare my meals. When I arrived at the room I couldn't enter the room because the check in code for the door was invalid, I arrived after hours so I had to call the emergency line to get the correct code. This was an issue but was handled quickly. The room and the view was amazing. Would for sure stay again. Spent 4 days/4 nights here. Loved the location and the room. I was disappointed and frustrated with the fact that we arrived to the room 15mins after check in and the "cleaning crew" (who were dressed very sloppy and in profressional) were still in the room. If check out is 10a there is no reason that 15mins after check in the room still isn't ready. Also a bit grossed out by he lint/hair covered dish rags. Also felt amenities were falsely advertised since some were for only hotel guests and not guests of this room. I was impressed that maintenance fixed the broken patio door handle so quickly. Overall the room is nice and the few faults didn't ruin my time. I would recommend the company provide more timely cleaning, as well as additional amenities, cleaning supplies, trash bags and toilet tissue. Would rent again, but don't think the room is worth the peak season prices.